Debt-to-Income, or also known as DTI, is a common mortgage term that describes a person’s monthly debt load as compared to their monthly gross income. Mortgage lenders use DTI to determine whether a mortgage applicant can maintain payments on a given property. DTI is used for all purchase loans and for most refinance transactions. NSH Mortgage can easily calculate your DTI for you if this is your first mortgage loan or you are an experienced buyer. Debt-to-Income is most commonly referred to, to answer how much home one buyer can afford. This term does not indicate the willingness of a person to make their monthly mortgage payments, only to measure a mortgage payment’s economic burden on a household. Most mortgage guidelines enforce a maximum DTI limit. Mortgage lenders calculate income a little bit differently from how you may expect. There’s more than just the “take-home” pay to consider. NSH Mortgage will perform special math for bonus income, give credit for certain itemized tax deductions, and apply specific guidelines to part-time work. The simplest income calculations are applied to W-2 employees who receive no bonus and make no itemized deductions. For W-2 employees, if you’re paid twice monthly, your lender will take your last two pay stubs, add your gross income, and use this sum as your monthly household income. If you receive bonus income, your lender will look for a two-history and will average your annual bonus as a monthly figure to add to your mortgage application, such as a residential mortgage loans. For self-employed borrowers and applicants who own more than 25% of a business, calculating income is a bit more involved. To calculate income for a self-employed borrower, mortgage lenders will typically add the adjusted gross income as shown on the two most recent years’ federal tax returns, then add certain claimed depreciation to that bottom-line figure. Next, the sum will be divided by 24 months to find your monthly household income. Income, which is not shown on tax returns or not yet claimed, cannot be used for mortgage qualification purposes. This may dampen your chances at receiving jumbo mortgage loans. In addition, all mortgage applicants are eligible to use regular, ongoing disbursements for purposes of padding their mortgage income. Pension disbursements and annuities may be claimed so long as they will continue for at least another 36 months, as can social security and disability payments from the federal government. Non-taxable income may be used at 125% of its monthly value. Through these different methods, you may find yourselves receiving better fixed rate mortgage and adjustable rate mortgage. For mortgage applicants, calculating debt is less straightforward than calculating income. Not all debt, which is listed on a credit report, must be used, and some debt, which is not listed on a credit report, should be used. Lenders split debts into two categories: front-end and back-end. Front-end debts include payments to your credit card companies and your student loans. Back-end debts are debts related to housing. To calculate your debts as a lender does, you will sum the following figures: monthly minimum credit card payments, monthly car payments, monthly personal loan payments, monthly student loan payments, monthly child support and alimony payments, and any other monthly payment which is not listed on your credit report. You should note that several exceptions to this list apply. For example, if you have a car loan or other payment with 10 or fewer payments remaining, the payment do not have to be included in your debt-to-income calculation. Student loan for which payments are deferred at least 12 months into the future can omitted as well. The sum of these figures is your monthly front-end debt. To calculate your back-end debt, add your mortgage payment to whatever other monthly payments you make in relation to housing. This can include your real estate tax bill, your homeowner’s insurance bill, and monthly assessments to an association among other items in your PITI. Your front-end debt and back-end debt sum to comprise your total monthly debt. If you are interested in having your front-end, back-end, or both DTI’s added up, NSH Mortgage can easily help. Most mortgage programs require homeowners to have a Debt-to-Income of 40% or less, but loan approvals are possible with DTI’s of 45 percent or higher. In general, mortgage applicants with elevated DTI must show strength on some other aspect of their application. This can include making a large down payment; showing an exceptionally high credit score; or having large amounts of reserves in the bank accounts and investments. Also, note that once a loan is approved and funded, lenders not longer track Debt-to-Income ratio. It’s a metric used strictly for loan approval purposes. 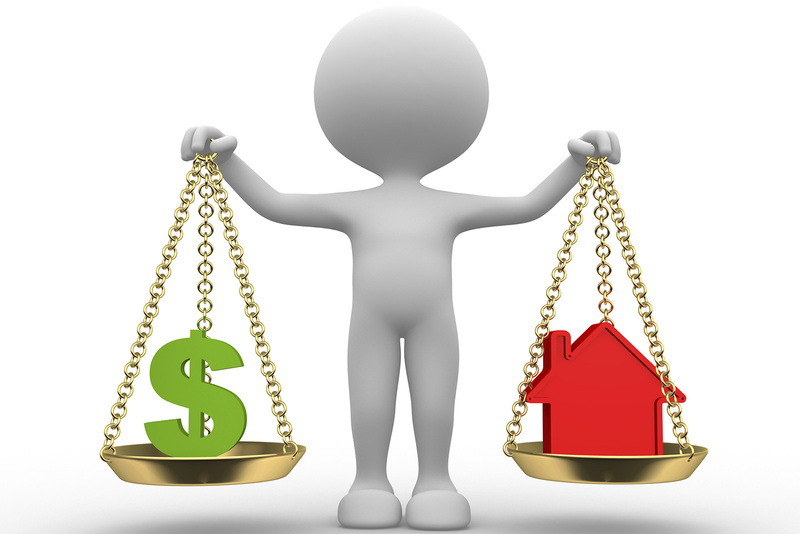 However, as a homeowner, you should be mindful of your income versus your debts. When debts increase relative to income, long-term saving can be affected. Many loans do not require Debt-to-Income amounts to be accepted. A few of these programs consist of the FHA Streamline Refinance, the VA Interest Rate Reduction Refinance Loan, and the Home Affordable Refinance Program. For today’s U.S. homebuyers, Debt-to-Income ratio plays an outsized role in the loan approval process. Buyers with a high DTI are less likely to get approved for a loan than buyers with a low DTI.